I know it's not quite fall yet. But with NCAA ball season starting on Thursday, I just couldn't help googling some "autumn themed" recipes. It doesn't hurt to think ahead a little bit. 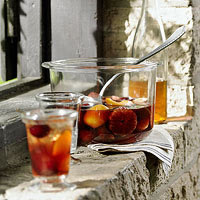 This sangria recipe will be perfect when the weather gets a little cooler and the leaves start to turn. Directions: Halve, quarter, or slice fruit. In 3-quart glass container combine fruits and molasses; stir until well-combined. Slowly pour in red wine. Cover and chill 2 to 24 hours. To serve, add sparkling cider and orange. Stir gently with spoon. Fill glasses with ice and add in sangria. Makes 8 servings.